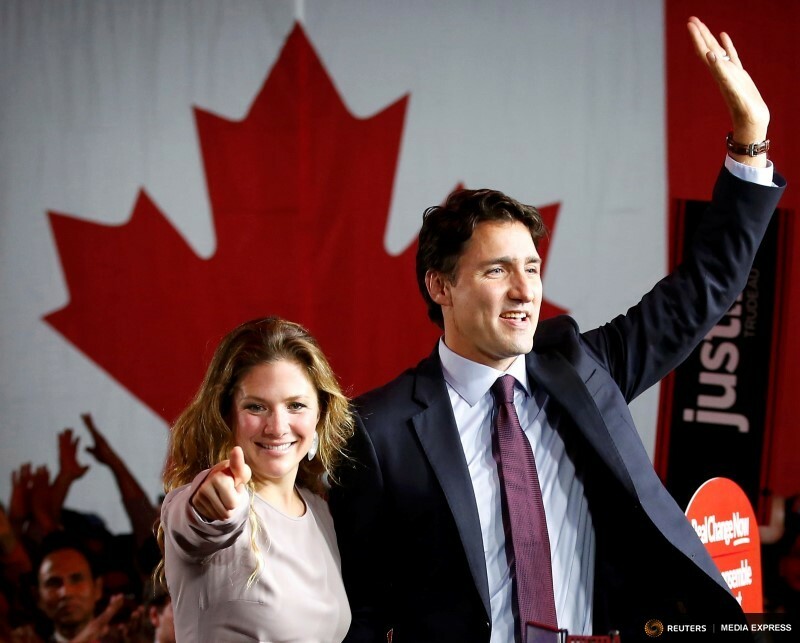 MONTREAL/CALGARY (Reuters) – Canada’s Liberal leader Justin Trudeau rode a late campaign surge to a stunning election victory on Monday, toppling Prime Minister Stephen Harper’s Conservatives with a promise of change and returning a touch of glamour, youth and charisma to Ottawa. The Liberals seized a Parliamentary majority, an unprecedented turn in political fortunes that smashed the record for the number of seats gained from one election to the next. The Liberals had been a distant third place party in Parliament before this election. Harper conceded defeat, ending his government’s nine-year run in power and the 56-year-old’s brand of fiscal and cultural conservatism. Trudeau, 43, the photogenic son of former Prime Minister Pierre Trudeau, pledged to run a C$10 billion annual budget deficit for three years to invest in infrastructure and help stimulate Canada’s anaemic economic growth. This rattled financial markets ahead of the vote and the Canadian dollar weakened on news of his victory. Trudeau has said he will repair Canada’s cool relations with the Obama administration, withdraw Canada from the combat mission against Islamic State militants in favour of humanitarian aid and training, and tackle climate change. 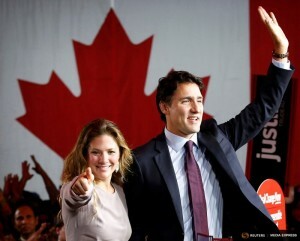 Trudeau vaulted from third place to lead the polls in the final days of the campaign, overcoming Conservative attacks that he is too inexperienced to govern to return to the Prime Minister’s residence in Ottawa where he grew up as a child. The Conservatives were projected to become the official opposition in Parliament, with the left-leaning New Democratic Party in third. Liberal supporters at the party’s campaign headquarters broke into cheers and whistles when television projected that Trudeau would be the next prime minister. Top Trudeau advisor Gerald Butts tweeted “Amazing work #TeamTrudeau. Breathtaking really”. 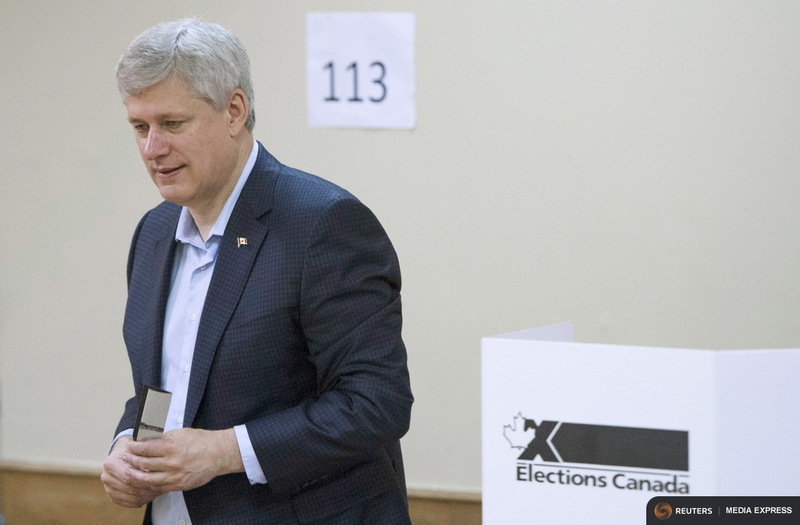 The Conservatives weren’t the only party that appeared headed for a crushing defeat. The third place left-leaning New Democratic Party’s fall was highlighted in Quebec, where it had the majority of its seats. Radio Canada projected it would end up with just seven seats, down from 54 in the last Parliament. 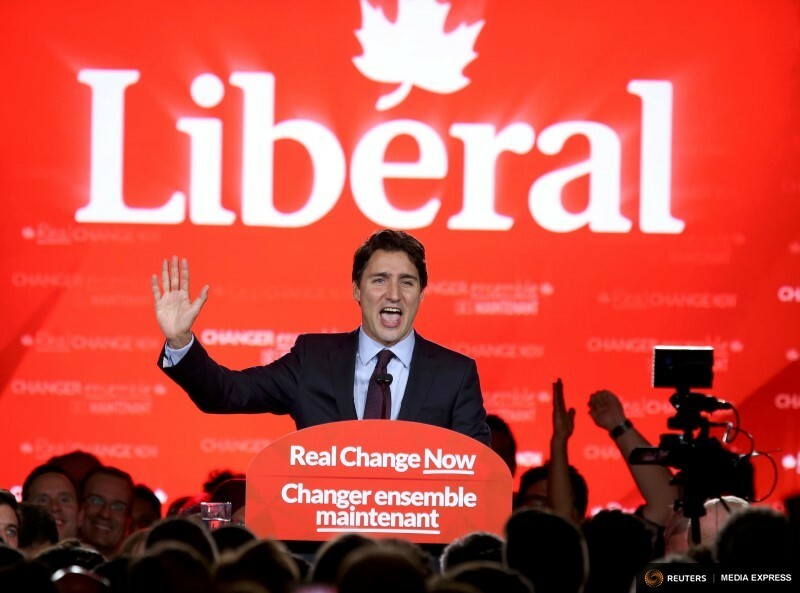 The Liberals’ win marks a swing toward a more multilateral approach in global politics by the Canadian government, which has distanced itself from the United Nations in recent years. The former teacher took charge of the party just two years ago and guided it out of the political wilderness with a pledge of economic stimulus and stirring appeals for a return to social liberalism. Independent, non-partisan and employee-owned, Facts and Opinions is funded by you, our readers. We are ad-free and spam-free, and we do not solicit donations from partisan organizations. Please visit our Subscribe page to chip in at least .27 for one story or $1 for a day site pass. Please tell others about us, and follow us on Facebook and Twitter. Born to a sitting prime minister who came to power in 1968 on a wave of popular support dubbed “Trudeaumania,” Trudeau will become the second-youngest prime minister in Canadian history and brings an appeal more common in movie stars than statesmen. Pierre once jumped from a trampoline into the crowd. With boyish good looks, Justin thrusts himself into throngs and puts his hand to his heart when listening to someone. Selfie requests are so common he happily takes the camera and snaps the photo himself, often cheek to cheek. He is the married father of three young children. 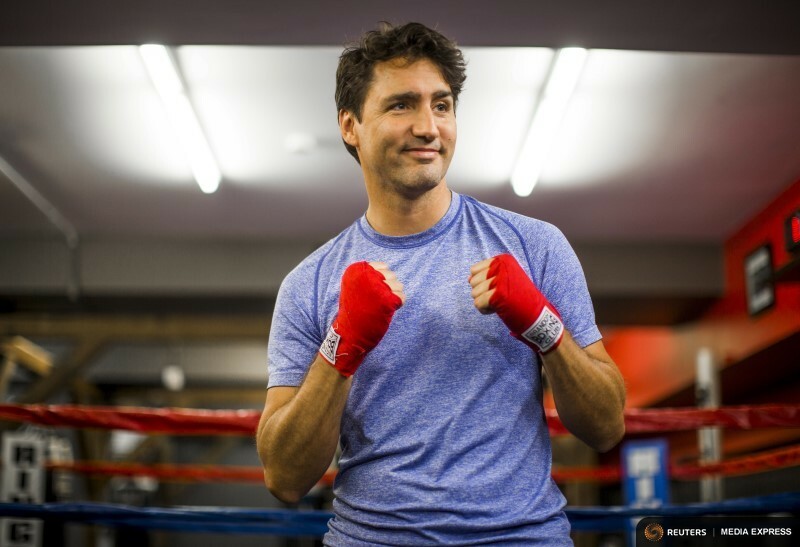 Criticized for being more style than substance, Trudeau has used attacks on his good looks and privileged upbringing to win over voters, who recalled his father’s rock-star presence and an era when Canada had some sizzle on the world stage. Pierre Trudeau, who died in 2000, was in power for 15 years – with a brief interruption – and remains one of the few Canadian leaders to be known abroad. Single when he took power, the elder Trudeau dated movie stars and models before marrying. He had three boys while prime minister, the eldest of whom now succeeds him in the nation’s top office. Financial market players had praised the Conservative government for its steady hand in economic management, which had spared Canada the worst of the global financial malaise. Trudeau has also promised to raise taxes on high-income Canadians and reduce them for the middle class. Political pundits have already began to speculate on the makeup of a Trudeau government while pondering what caused the downfall of Harper, 56, who has been criticized for his aloof personality but won credit for economic management in a decade of global fiscal uncertainty. MONTREAL (Reuters) – The long Canadian election campaign was supposed to highlight just how inexperienced Liberal leader Justin Trudeau was and give the ruling Conservatives an ample supply of gaffes to use in attack ads. The gambit underestimated Trudeau, the 43-year-old son of charismatic former Prime Minister Pierre Trudeau, and, by setting expectations so low, may have helped him instead. Trudeau’s Liberals will form Canada’s next government after defeating Conservative Prime Minister Stephen Harper on Monday. The seeds of the Liberal victory were sown in July, when the party ran third in polls behind the left-leaning New Democratic Party and the Conservatives. But his inner circle, including campaign co-chairs Katie Telford and Dan Gagnier, principal adviser Gerald Butts, and chief of staff Cyrus Reporter, backed Trudeau’s position that they should focus on the positive, as they see it. “We were not surprised by the negative ads. It wasn’t a new thing. But Justin Trudeau’s optimistic high-road approach struck a chord,” said Chrystia Freeland, a Liberal member of parliament. The strategy was to portray a sunny personality through ads, speeches and personal contact with ordinary people. Trudeau, who considers himself “a learned extrovert,” spent half his time at campaign stops milling through crowds and posing for selfies. Most of those pictures made their way onto Facebook, Instagram and other social media where they were reposted or retweeted for a multiplier effect. By August, the Liberals were largely indistinguishable from the NDP in their appeal to centre-left voters and the three main parties were running neck-and-neck. A dearth of major economic policies had helped NDP leader Thomas Mulcair eat into Liberal support as he laid out policies on cheap daycare and a C$15 ($11.60) minimum wage for federally regulated workers. At a meeting in June, the party realized its plan to balance the budget and spend on infrastructure, while enriching the overall tax package for the middle class, was no longer viable as the fiscal picture worsened on weaker oil prices, two senior Liberals familiar with the discussion said. They would probably have to go into deficit or scale back their promises. A final decision was not made until August, the two Liberal sources said. Some had advocated running big deficits – as much as C$40 billion or C$50 billion, similar to the levels the Conservative government ran in response to the 2007-09 financial crisis – but they settled for a deficit of up to C$10 billion a year for three years, a third senior Liberal said. They nervously eyed the NDP, lest they pip the Liberals to the post. It was a risk, the Liberal insiders said, but in the end it gave the party a clear distinctive policy and positioned them left of the NDP, which had pledged a balanced budget. “As of that moment, I think it became clear that we were the party of real change and that Stephen Harper and Tom Mulcair were two peas in a pod on the economy,” said veteran Liberal legislator John McCallum, a former bank chief economist. The Liberals also got a lift from a controversial government attempt to ban the veil worn by Muslim women, the niqab, during citizenship ceremonies. Both Mulcair and Trudeau opposed the ban, but anti-niqab sentiment was heavy in the francophone regions of Quebec, where the NDP is strongest. NDP support in Quebec began to plummet, dragging down its national numbers, and then NDP voters elsewhere started to migrate to the Liberals. “We had the same position (as the NDP). The difference was that when it came up, we had something else to talk about,” another Liberal insider said, referring to the party platform. The NDP, on the other hand, were offering cheap daycare, which Quebec already had, and balanced budgets, which were unpopular in a province tired of austerity. And while the Conservatives gained in Quebec, Harper’s niqab stance and other positions seen as anti-immigrant did not go down well in other parts of Canada. Good fortune also played a part. 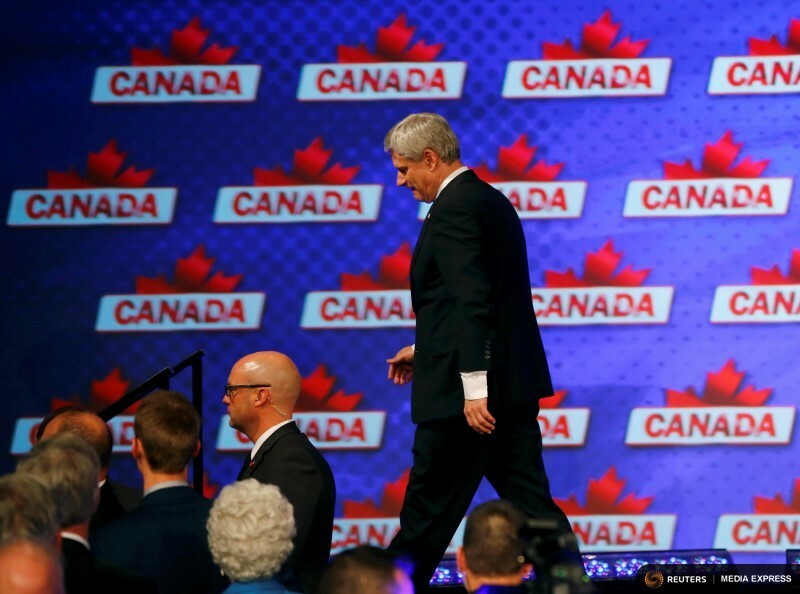 The famed wall of ads the Conservatives were expected to mount at the end of the campaign fizzled. While the Tories bought front page newspaper ads in the campaign’s final Saturday and had their share of broadcast ads, there was no evidence of a tsunami that swamped the Liberals. Instead, the Liberals benefited in the final week after taking a punt in August to buy ad time for October’s baseball playoffs. The price then was C$12,000 for a thirty-second spot in Canada. When the Toronto Blue Jays made the playoffs, drawing massive Canadian television audiences, the cost zoomed up to C$140,000 apiece. By then, the Liberals had their exposure locked in at the end of an expensive, 11-week campaign. On Monday, some Conservatives grudgingly conceded just that. “You have to hand it to the Liberals: they’ve run a really good campaign,” said a Conservative member of Parliament. Niqab: Radical feminism or female subjugation? Facts and Opinions is a boutique journal, of reporting and analysis in words and images, without borders. Independent, non-partisan and employee-owned, F&O is funded by you, our readers. We are ad-free and spam-free, and we do not solicit donations from partisan organizations. Please visit our Subscribe page to chip in at least .27 for one story or $1 for a day site pass. Please tell others about us, and follow us on Facebook and Twitter.